It’s back! Safe, effective–and FUN. 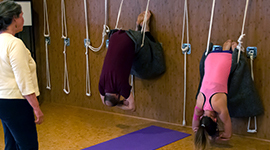 You’ll feel great after an evening of doing yoga using our unique rope wall! Accommodations and adjustments can be made for any limitations. Only $15–or regular students may use their virtual punch card!